The gundams are mobile suits, also called mechs, that are made out of an alloy stronger than anything else man has discovered, gundanium (hence the name gundam). they were sent to earth on a mission to bring about peace and the end of oz and the alliance. Heero- heeor is the main character if you must pick one. he's unbelievably strong despite his appearance, he can handle the zero system perfectly, and he seems to be the one always saving the day. although he's only 14, he has been raised as a pro assassin, mobile suit pilot, and gundam pilot, as well as terrorist. Duo- duo is slightly less herois, in fact, much less, but he's got an incredible second phase gundam, deathsycthe hell. this version of the deathscythe has added wing package, and the thermal energy blade is much more effective on the newer oz armoring. Quatre- quatre is a loving and caring individual, and would rather this entire war never have started. he finds a friend in trowa, and pilots the sandrock gundam. he is rather wealthy, but that didnt change him much. 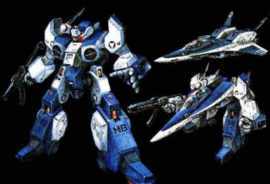 he is sometimes assisted by his servant/guardians, which pilot the maganac class mobile suits. trowa- trowa is minorly skitzophrenic. he pilots the heavy arms gundam, which has litlle influence in space. he joins the circus, and goes into a relapse when quatre finds him. wu Fei- he pilots the shenlong gundam, although he personally calls it Nataku, after his dead wife. this gundam was meant to impersonate the mythical dragon in many ways, and wu fei matches it. he fights only honorably, and never picks on someone weaker. he is the perfect warrior, nevr underestimating or wreckless. This is another good one, but still not the best. its got some good animation, but most of it is average, and its sometimes hard to follow the story, especially if you miss an episode. this doesnt mean that you shouldnt watch it, it just means hat if youre gonna watch it, then youve got to watch it the whole way through and pay real good attention to whats happening.